We have posted several blog posts and shared insights on S/4HANA Fashion, taking a closer look at how the new solution and its functional innovations and enhancements help fashion brands transition to the digital age since its introduction. What is SAP S/4HANA Fashion? Helping Customers get started on SAP S/4 HANA Fashion. Ever since SAP announced SAP S/4HANA, there have been many questions about the future and roadmap for industry specific solutions such as SAP Fashion Management Solution. During a recent webinar, we discussed some of the most frequent questions we get from customers regarding the roadmap and migration to SAP S/4HANA. 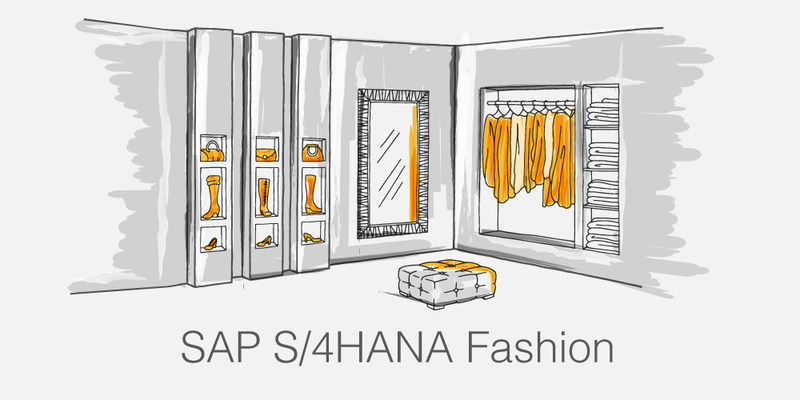 What is SAP S/4HANA Fashion? Announced last week at ASUG Apparel Fashion and Footwear Fall meeting, SAP S/4HANA Fashion provides significant business innovation for fashion companies - merging wholesale and retail processes onto a real-time in-memory platform to drive retail opportunity in key areas such as omnichannel, merchandise management, in-store commerce and inventory visibility. The primary benefits of SAP S/4HANA Fashion simplifies the underlying architecture, modernizes the user interface, and sets the stage for new functionality and processes – in addition to being the launching point for new business opportunities. We take a closer look at how the new solution and its functional innovations and enhancements help fashion brands transition to the digital age. Fashion companies use planned demand data as a base to support requirements planning methods in an effort to optimize stock levels across the supply chain. With S/4HANA Fashion, fashion brands can intelligently match demand and supply, with inventory segmentation capabilities and greater visibility into inventory across locations and channels. Store associates and managers can access product and inventory data from anywhere in stores and at any time. This helps improve productivity, store performance, and increase store sales, shopper loyalty, and customer and employee satisfaction. Fashion brands need to keep track of inventory level across locations and channels e.g. an increase in inventory when a goods receipt is posted or a decrease in inventory when a goods issue for a sales transaction is posted. With S/4HANA Fashion 1709, you can get real-time information of your products, including how much stock is available in your store, DCs or in stores nearby. Review stock for generic articles with variants and inventory values at retail price. Plan, control, and manage the flow of merchandise from suppliers to distribution centers and then on to stores or customers. Carry out cross-docking in the distribution center through support of push and pull processes to move the merchandise through the warehouse more quickly, thereby reducing the costs for processing and storage. Automatically convert goods that are to be transferred from a site's consignment stock to a site's own stock. Automatically valuate all goods movements at retail based on the material ledger and post physical inventory differences at retail. Create and maintain sales orders for single articles, generic articles along with variants, structured articles with sub-items and full products with empties. Pack Separately – Ship Together (PSST) allows fashion companies to identify the order items that need to be shipped together based on customer business rules. The grouping rules are used to assemble sales order items (within a single or even across several documents) into PSST groups and these can be processed together in Supply Assignment (ARun) and Outbound Deliveries. Deliver optimum of amounts merchandise to a large number of stores on a regular basis with S/4HANA Fashion. Automated processes helps optimize and integrate merchandise flow across the supply chain, including processes that involve third parties. Leverage master data and movement data required to run replenishment processes. Use order proposals as the basis for creating purchase orders for external or internal suppliers. Create a merchandise allocation to control which stores get which merchandise in which amount and when (push process). Make stock figures and sales data available to suppliers and manufacturers to support their activities with regard to material requirements planning and replenishment planning. How is SAP S/4HANA Fashion different to SAP Fashion Management (FMS)? SAP S/4HANA Fashion inherits most of the underlying concepts and thinking from FMS. However, there are few elements that are different on S/4HANA. Download our cheat sheet to find out what’s new and what has changed for existing SAP customers. If you’d like to learn more about what these changes mean for your organization, you can schedule a lunch n' learn session with us here. With S/4HANA Fashion, sales prices are planned based on various factors such as purchasing prices and margin goals, taking into consideration what consumers are willing to pay for products in stores or through non-store channels. Define retail sales prices for articles at the level of sales channels or sites with a validity period based on strategies such as planned markups on procurement prices. Recalculate and maintain retail sales prices based on changes in influencing factors, such as purchase price adjustments or the need to comply with a new business strategy. Available with a separate license, Omnichannel Promotion Pricing (OPP) ensures correct and consistent effective sales prices in all sales channels with added flexibility of applying simple discounts and mix-and-match promotions to shopping carts. Related Resource: Webinar on SAP S/4HANA 1709 Release. What's new on SAP S/4HANA for Fashion and Vertical Business? Through effective buying processes, fashion companies can now procure goods faster and at lower cost from suppliers globally in order to adopt buying processes to specific merchandise and increase procurement process efficiency through order consolidation. Create purchase orders for single articles, generic articles together with variants, structured articles with sub-items, and full products with empties. Automate purchase order scheduling at a highly granular level along the inbound supply chain by defining important intermediate steps such as Exfactory dates and the arrival of merchandise at shipping destinations. Collect and consolidate multiple store orders into a single purchase order for external suppliers to eliminate inefficient manual procurement activities associated with large numbers of individual orders and speed up supply chain processes from supplier to warehouse to retail location. As you can see, beyond the underlying changes in technologies powering this new wave of ERP are new business capabilities; delivering a transformational change to each department. With all the available and planned SAP innovations now focused on SAP S/4HANA, and given the product support and maintenance plans, the need to adapt SAP S/4HANA Fashion is a given. The longer an organization waits to begin the journey, the more they miss out on capabilities exclusive to SAP S/4HANA Fashion, the harder it will be to catch up. As a next step for customers looking to get a head start on their digital transformation journey, attune will be providing S/4HANA Fashion demo and POC services. As a result of our deep involvement in SAP Fashion Solutions and close collaboration on the S/4HANA Fashion product’s development including continuous feedback based on validation testing, we can offer a comprehensive analysis of where your current processes could be improved with the real-time capabilities of S/4HANA Fashion platform, identify the most appropriate path to S/4HANA and establish the key project considerations and tools needed to support the transition to S/4HANA. If you'd like to know more about S/4HANA Fashion, contact us here.